5.0 out of 5 starsSweet, sweet story..loved it! Like the other reviewers, I thoroughly enjoyed book 2 of Sweet Home. I don't know if other readers would like a word of advice, but I read the two books concurrently. Each time I reached a significant part in book 1, I flipped over to the same stage in book 2, and so on until the stories separated. The only thing is, the prologue in book 2 begins at a major step in the story, so that might put you off reading them together. Again, just like book 1, the writing standard was excellent, as the (sometimes tragic) circumstances continue (be prepared for a lot of drama...you may also wonder, why the **** doesn't Rome just move to the other side of the country to escape his crazy family?) Anyway, the plot and characters were skilfully developed to further Molly and Rome's journey. I like the way Tillie treats all parts of the storyline with the same amount of importance and how she gives you a moment to reflect by including visual descriptions of various scenes. Tillie is certainly a generous and giving writer. As a female, I love reading books with a male perspective as I learn so much about men. I thought Tillie had a good handle on Rome's voice and she gave us insight into his motives, reasonings, feelings and backstory. His raunchy thoughts were hot and sometimes hilarious as his head wrestled with his, well, you know...then, his anger and pain were described in depth. At times I felt for him when the normally sweet and loyal Molly couldn't find the strength to dig in and fight, due to her shredded past. The final HEA was exquisite, but expect a giant lump in your throat (tissue box required). Based on the standard of these 2 books, I have downloaded the other books in the series. 5.0 out of 5 starsOh sweet Romeo!! If you think that you know the story of Molly and Rome - think again!!!! This book is from Rome's POV but this book felt like a whole new book on its own. I have never FELT so much hate, anger, sadness, love, and heartbreak in a book. Not only did this book reopen old wounds as we relive this couple's painful journey, but new wounds are created as we experience the extreme cruelness of Rome's parents. The ending chapters are PERFECT!!!! I could finally breathe a sigh of relief for these two star crossed lovers. 5.0 out of 5 starsTillie's done it again! Oh my word! I couldn't wait to read this from Rome's POV. I am so glad I did! It was fantastic to get his take on things. To read more into the 'whys' of his reactions, and the depth of those reactions to and because of Molly. Tissues are a MUST when reading this. As I am writing this review, I have to keep blotting my eyes because I am so emotional. I loved the conclusion... Tillie gave more than I expected. It was such a well rounded story as the first was. I grew more in love with the characters all over again. I won't rehash the plot as other reviewers have done better than I could. This is a keeper and I will read it again! Would I recommend this? A resounding YES! Is this a keeper? YES! Would I read this again? YES! What can I say except for I felt more for Rome this time around. Loved reading his POV. 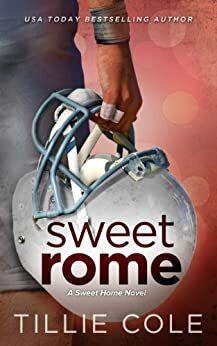 Sweet Home I felt not so drawn to the character of Rome as I felt he was too rough around the edges but getting his POV has 100% made me a fan of his. Cant wait for the next installment. Good, but you've already read the whole story in "Sweet Home", I didn't mind this one as I read it straight after so everything was still fresh in my mind, but at the same time it did mean that it felt very repetitive as I'd read it all before! I think it would've been better to combine the two stories and have a her then his chapter sequence. ALOT better than Sweet Home, but I am a little partial to a males POV...I love getting into man's head! This is basically Sweet Home told in Romeo's POV and I found it a lot better than the first. More grit, more dirt, more steam!